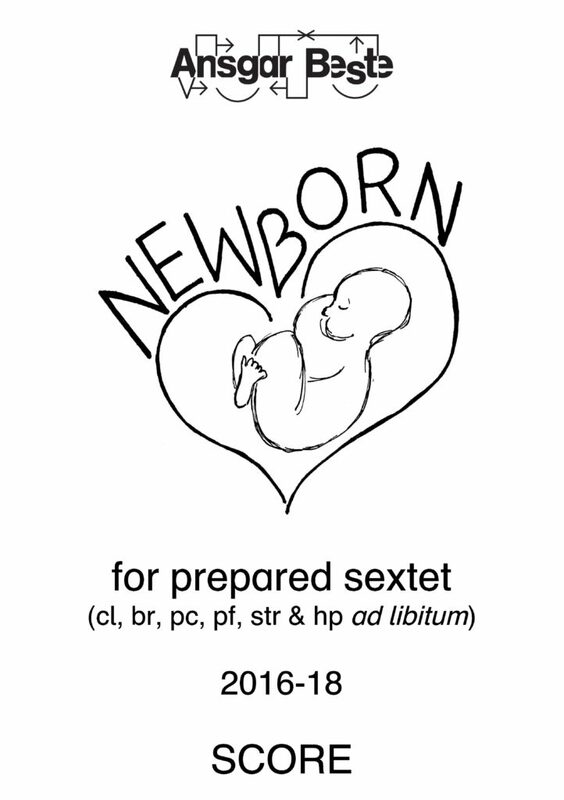 Setting Prepared sextet: clarinet in Bb, optional brass instrument, percussion, piano, optional bowed string instrument and harp ad libitum. Period of creation 2016-01-08 to 29 and 2016-02-16 to 23 (1st version); 2016-11-11 to 15 and 2017-08-16 and 2018-03-28 to 2018-04-12 and 2018-07-21 to 24 (2nd version). Commission / occasion 1st version: Commissioned by the nyMusikks Komponistgruppe (Nor) for the ensemble asamisimasa (Nor). 2nd version: Commissioned by the institution Musik i Syd (Swe) for the Riot Ensemble (Gbr), funded by Norsk kulturråd / Fond for lyd og bilde (The Arts Council Norway / The Audio and Visual Fund) (Nor). Newborn is the English term for French nouveau-né. The main idea of the work is to reflect, both sonically and formally, the evolution of the newborn child, the development process from the “Big Bang” of the fertilization to the constant growing up and the increasing recognizability of organs and parts of the body and finally to the miraculous birth of the complete human being. After a big initial bang, the musical development starts with nebulous, “neutral”, non-rhythmic sound-lava, consisting of continuous distorted sounds and constant repetitive scraping. Gradually, rhythmic cells and motifs appear and evolve into concrete shapes and themes (i.e. organs and parts of the body), while the timbre transforms into whistling and fluido sounds as well as into shorter granular and repetitive attacks. Finally, single attacks of dry and gong sounds emerge into larger-scale structures forming an increasingly articulated and dense rhythmic texture (i.e. a complete human being). 8,33% Selection by the Ensemble Aleph (Fra) at the competition 8th International Forum for Young Com­posers, 5/60 (2017-07). 25% Selection by the festival Nordic Music Days 2017 (Swe) for a commission to be premiered by the Riot Ensemble (Gbr), 3/12 (2017-08). 31,58% Selection by the ensemble asamisimasa (Nor) for a commission by the nyMusikks Komponist­gruppe (Nor), 6/19 (2015-05).